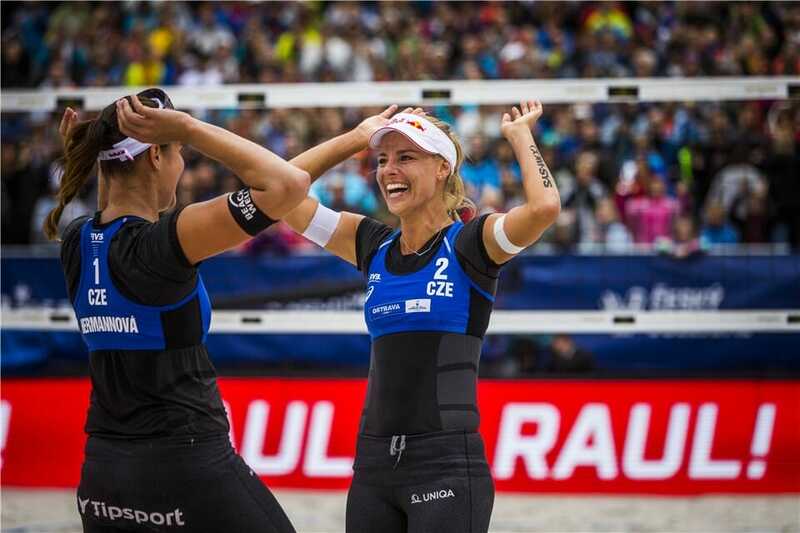 In a thrilling and entertaining final, Marketa Slukova and Barbora Hermannova (Czech Republic) won the FIVB Ostrava Open in front of their compatriot crowd. Despite rainy weather, the centre court was completey packed with an enthusiastic crowd cheering for the Czechs. In the end it was a close call but after having lost the first set, the Czech team beat Heather Bansley and Brandie Wilkerson (Canada) in three sets (17:21, 21:15, 15:13) to win their second gold medal together. The first set was dominated by strong blocker Brandie Wilkerson who sent the Czech attacks back to where they came from repeatedly. In the second set it was Marketa Slukova with amazing defending who caught the Canadians by surprise. Being pressured by Canadian attacks, Slukova scored several points by returning the attacks on one. The Czechs continued their strong performance in the third set and claimed the win with their fourth match point. The bronze medal went to Borger/Kozuch who beat Bieneck/Schneider in an all-German bronze medal match. In the men’s competition, Herrera/Gavira (Spain) claimed gold against Kantor/Losiak (Poland) in three sets after winning an extended first set (27:25, 15:21, 15:11). Semenov/Leshukov from Russia won bronze against Czech team Perusic/Schweiner.